In large skillet, heat oil over medium-high heat. Sprinkle both sides of chicken tenders with salt; add to skillet. Cook 4 to 6 minutes, turning once, until chicken is no longer pink in center. Remove chicken from skillet to cutting board; cut into small pieces. In same skillet, cook celery over medium heat 2 minutes, stirring frequently, until tender. Stir in butter and desired amount of pepper sauce. Add chopped chicken; cook and stir until hot. To assemble tacos, spoon chicken mixture onto center of each warmed tortilla; top with cheese, celery leaves, parsley leaves and avocado. Fold sides of tortilla over filling; serve immediately. Instead of topping the tacos with avocado slices, add a dollop of sour cream. Or use both! Make vegetarian tacos by replacing the chicken with sautéed bell peppers and onions. 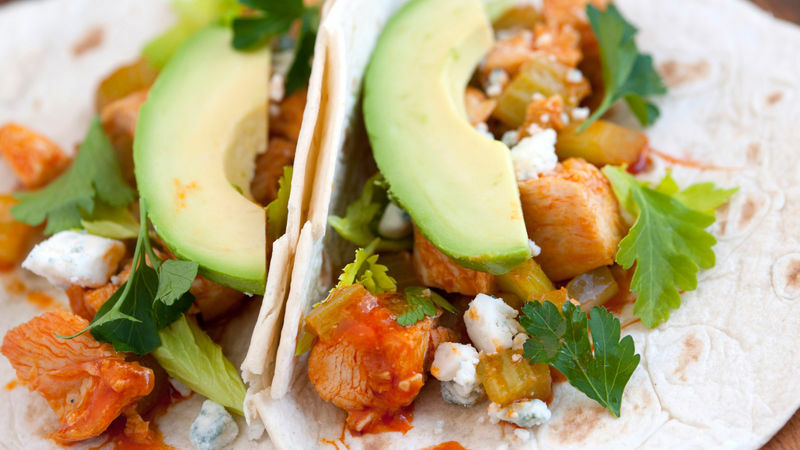 Meet the game-day mashup of your dreams: buffalo chicken tacos. It only takes 30 minutes to mix these up in your skillet, and they’re easy to riff on, too. You could also easily make this recipe vegetarian by replacing the chicken with sautéed bell peppers and onions. Or swap in avocado slices, if you want a creamy element without the dairy. In fact this recipe is so simple, you could add another taco recipe to the menu for a playoff event that can’t be missed.